It’s that time of the year when you evaluate how the year has been to you. 2011 has been uneventful, boring even – but I am grateful to how kind it has been to me. I look around and know I am blessed. Blessed that the year was what it was. 2012 promises to be exciting, it promises to test us more than we have ever been tested! This is one year I am making no resolutions, I am going to let life lead me where it wants. I enter the year with no preconceived notions, just a promise to try to do my best! And I hope that the Good Man above continues to keep an eye on us! So here’s wishing all of you a fantastic year ahead!!! If you have decisions to make, may you find the strength to deal with the consequences if any. We just need to keep the faith and remember that we will always find it within us to deal with everything …if we allow ourselves too. This entry was posted in Bloggies, Faith, Feelings, Growing Old, Nutty Thoughts, Towards a better me and tagged Dreams, faith, Feelings, Thoughts on December 30, 2011 by Nuttie Natters. So what has been happening with me? Well we are back from a 5 day trip to Langakwi and while i may not declare this to be among my best holidays – a holiday is a holiday is a holiday and i shall not complain…Other than the fact that i found Malaysian’s very unfriendly, quite unlike their Thai counterparts. Anyway, that apart…let me think what have i been up to? Speaking about books – have u read the secret of the Nagas – so recommended. I love Amish’s imagination. i know people who dont like the fact that mythology has been twisted so much but hey it’s his interpretation – take it for what it is. In other news – i am still existing at work. I feel disconnected from facebook and other social media. I keep in touch with few people and i keep in touch with them a lot! Ummm…on an irrelevant note, my house – ufff it’s a mess. i have decided i will do one task a day and put this home of ours into order. I want my life to be a holiday. I want to win a million dollars and never have to work again. I want to find a “higher” meaning to my life. I want to look beautiful, i want to be efficient. I feel i am not living my life fully and just about existing. OK all that said, do i promise to blog more? I don’t know. This entry was posted in Blah, Bloggies, Cribby Nut, Feelings, Holidays, My take on the world in general, Nutty Thoughts, The Nut and tagged Books, Dreams, Feelings, Holidays, Me, Rants, Thoughts, Work on September 5, 2011 by Nuttie Natters. 1. I have been busy and hence away. But in my defense i have been doing some creative writing – my appraisal, 45,213 useless work proposals, Smart Alec FB comments, blog comments and hence Nuttie Natters has been ignored. 5. The rains in Mumbai – Sigh, i love them and hate the fact it aint raining as much. But the breeze nowadays makes me feel so fresh. Maan i lvoe the monsoons! hell i have nothing more to say, Gulp is the end of my blog near? This entry was posted in Bloggies on June 25, 2011 by Nuttie Natters. Yay an Award and more about me! Yay!!! 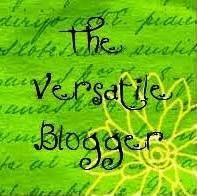 Miss Merry Musings has very kindly awarded me with the versatile blogger award. Thank you Merry Musing, you are very kind. I have just started reading her blog and am enjoying it, and i am so thrilled to know that she is a fellow Chalet School fan. You hardly ever find any in the world. 1. Thank the person for the award – Thank you Madame! 3. Pass on the award. 1. I am P-E-T-R-I-F-I-E-D of birds. I can handle cockroaches, rats, lizards and the like but a bird setting on my window is Na-Da. I shudder to drive away the bird even through a closed window. The cruel eyes and beaks scare the S*** out of me. I have a major “ick” factor and can’t even pick up feathers which might inadvertently fly into the house. Even While i type this i feel my fear!! 2. I am clumsy on my feet. I have a tendency to fall on/twist my ankles on ummm Flat roads. I dont need heals or gaddhas on the road to assist me. I have successfully fallen down any steps i decide to descend unless I walk down the steps – like a baby – right foot first, wait for left foot, left foot arrives and then move on to the next steps. Useless information: Earliest memory of the Tall One in B-school was him looking shocked at a very embarrassed me sliding down the steps on my bum!!! 3. I talk to myself while walking alone. I used to think of it as thinking in my head until i one day actually heard my voice speak to me. And until recently i thought a lot of people did this until the Tall one very kindly called me “weird” for wanting to go for my walk once the sun set so that people can’t make out i am talking to myself. 5. I am a weird “drinker” of alcoholic beverages. I don’t get what people enjoying about drinking – but i drink myself silly every new year, feel ill and declare myself off alcohol for the rest of the year causing people to believe that i am pregnant. 6. I have the annoying habit (i am told it is annoying by the man i married) of animating everything. Everyonething has life and will be named and will talk to you in moments of distress. Case in point…Swiffy reddy who stamps her foot when ppl talk of buying a new car. Swiffy reddy is our red swift Ok dont book my place in the psychiatry word yet. I am not done. One more random fact to go. 7. As a kid if i was engrossed in a book, i took it everywhere so much so that i used to walk on the road with a nose in a book causing a concerned neighbour to complain to my mom as to how oblivious i was of the traffic. I am not telling whether i still do the same. I pass on the award to the lovely Celestial Rays. I love her blog and usually read them unread until i can be sure there will be absolutely no interruptions from the real world. From food, to blogging about AB, to bald men to fashion – CR covers them all in style. But of course her best blogs will always be the memoirs of her father. Take it away Celestial Rays. This entry was posted in Bloggies, Drama Queen, My take on the world in general, The Nut, This n That and tagged Blog, Me on April 15, 2011 by Nuttie Natters.